In 1958, Gilbert converted to a five-digit numbering system. 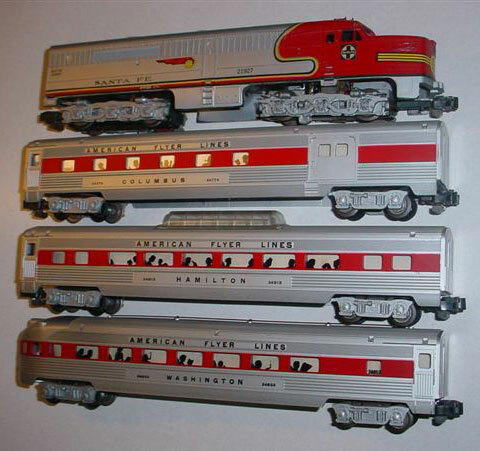 The fourth generation of streamliners, then, was little more than a continuation of the #96x series, renumbered according to the new five-digit system. In fact, unsold inventory was sold in new boxes bearing five-digit catalog numbers even though the car inside the box had the old 96x number! Unlike Gilbert's normal numbering, the first set numerically was actually made after the higher-numbered set. Reminds me of "The first shall be last and the last first." #24773 Columbus Combination car made in 1960-1962. #24793 coach car made in 1960-1962. #24813 Vista Dome Car made in 1960-1962. #24833 Observation Car made in 1958 and again in 1960-1962. 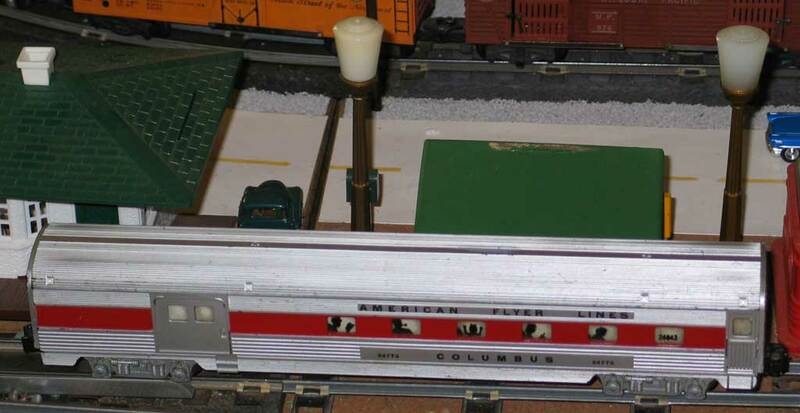 #20169 Special Train Set made in 1959. It was pulled by the #4713 Santa Fe Alco ABA set and comprised the #24773 Columbus Combination Car, the #24813 Vista Dome Car, and the #24833 Observation Car. It came with a #708 Air Chime Whistle Control Unit, #22020 Transformer, #26990 Track Terminal, and 12 curved and 4 straight track sections. #20620 Santa Fe Chief passenger set made in 1960. It was pulled by the #21927 Santa Fe Alco A-Unit and comprised the #24773 Columbus Combination Car, the #24813 Vista Dome Car, and the #24833 Observation Car. It came with a #704 Manual Uncoupler, #22020 Transformer, 2 #26810 Pow-R-Clips, and 12 curved and 2 straight track sections. 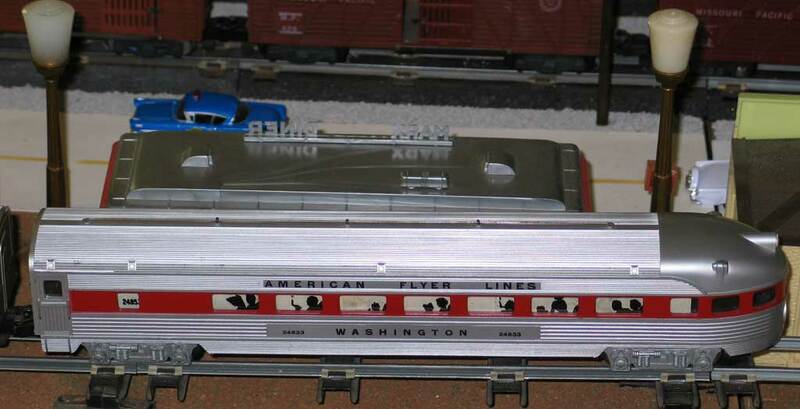 You will also see them listed as being in the #20083 Santa Fe Chief passenger set sold in 1957, but that set really had the 96x cars in five-digit boxes; it was a means of selling off the unsold 1956 inventory.